Back in March we announced that eroomcreative had won a pitch to design an exciting new car care product. At that time we were sworn to confidentiality but now we are able to release imagery of the product. The brief was to develop two new brands that, while complimenting each other, needed to have very separate brand values and still remain premium design cues. 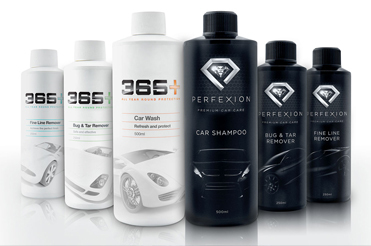 Both brands, Perfexion Premium Car Care and 365+ All Year Round Protection, are the result of an extensive evolution. Once we had the brands approved we needed to look at the various business requirements for packaging, point-of-sale awareness, sales training literature and online presence. Many of these are still works in progress but rest assured we will be crowing about them as they are released.